The Canada Women’s Sevens organizing committee announced today that single-day tickets for the 2018 HSBC Canada Women’s Sevens on May 12-13 at Westhills Stadium in Langford B.C., will go on sale Tuesday, April 24 at 10:00am PST. Tickets can be purchased through canadasevens.com or by calling the Ticket Rocket Box Office: 1-855-842-7575 – hours 10am to 5pm, Monday to Friday. The HSBC Canada Women’s Sevens is the fourth stop on the five-stop Women’s Sevens Series, which wraps in Paris on June 10. 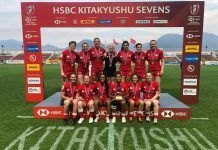 After two competitions, the Canadian Women’s Sevens team sits number 3 in the standings, and will be competing on the third stop of the Series this weekend at the Kitakyushu Women’s Sevens in Japan. Last year, Canadian Women placed second in Kitakyushu and then Langford, where they thrilled the crowd with an electric match against New Zealand who scored late to seal their victory. This year, Canadian women will be seeking their first tournament title on home soil.